In real life, emergencies and emergency planning are no joke, but too often we get caught up in the day to day busyness of our lives and take proactive steps to prepare for life’s unpleasant surprises. If the idea of being prepared for emergencies, is overwhelming, let me suggest a simple baby step. Plan and prepare for a one-week emergency. By far, this is the most likely event you and your family will encounter whether it’s a severe weather event, a natural disaster, or a flu bug that hits everyone in the family, mom included. One of the easiest things you’ll ever stock up on is water. It’s as simple as refilling clean 2-liter soda bottles with tap water, labeling them with the date filled, and storing them in a closet or under a bed. Fourteen of these bottles is a week’s supply of water for one person. Empty juice bottles work just as well. 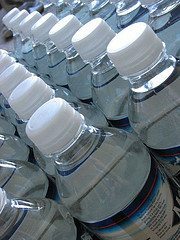 Buy a few cases of bottled water if you like, and you’re set. This step is a little more tricky because I want you to assume that your power will be out for some or all of this week-long emergency. Think about meals your family would eat that require little preparation. Without electricity, you’ll be eating things like cereal with dehydrated milk and pudding cups. Stock up on some energy bars, applesauce, jerky and dehydrated fruits and veggies. Peanut butter and honey on crackers, Dinty Moore stew, pudding and applesauce cups, and trail mix will keep tummies filled until life returns to normal. With a black Sharpie, circle the expiration dates on these products since many aren’t intended for long-term storage. Don’t miss my series, “The Baby Steps”, with a new step posted each Wednesday! Subscribe via RSS feed or my email newsletter so you don’t miss a thing.